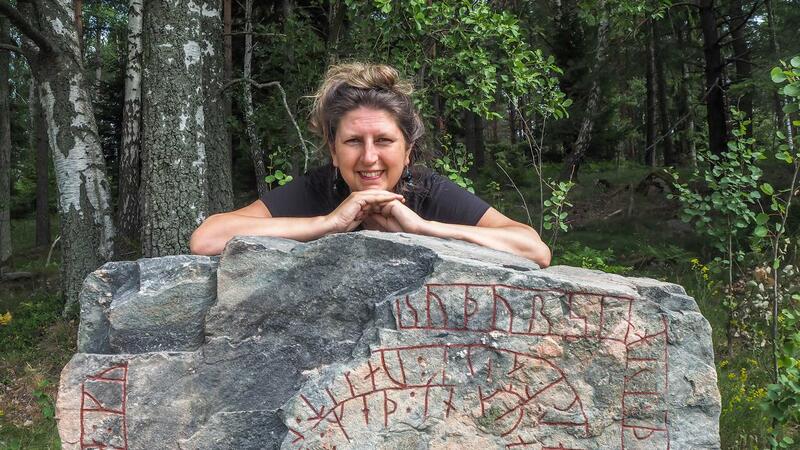 Imelda Almqvist, teacher of Seidr and Northern Tradition material, discusses what the rune row known as Uthark is and how it relates to the Futhark. I was introduced to the runes by Scandinavian teachers and rune magicians. Rune magicians are aware that every single rune has both a “light side” and “dark side”. By this I mean that the light side refers to the life-giving processes of creation unfolding, beginnings and growth - while the dark side refers to death and endings in all its manifestations. They are two halves of the same coin: creation cannot exist without destruction. In on-going cycles the very building blocks for creation are freed by the processes of death, dismemberment, deconstruction and decomposition. In classes and on summits I often say: "The Forces of Destruction are unfailingly in service to the Forces of Creation" - but to our human eyes it surely does not always appear that way!! I personally view all the runes (in this case of the Elder Futhark) as a wheel or circle. Meaning that, in some way, every single rune can pose the starting point for a journey (of learning and unfolding)! There is a theory (disputed and controversial, but underpinned by compelling arguments) that in a time after Scandinavia converted to Christianity - and eventually witch hunts occurred there (same as in other locations in Europe) - that teachers of esoteric material were forced to preserve powerful material by using ciphers or “hiding things in plain sight”. In 21st century language I often use the word “dial” with students: a dial can be turned clockwise or anti-clockwise to activate a new setting or arrangement. Following this metaphor, there is a belief that rune magicians deliberately “dailed” the wheel of the runes back by one position, meaning that the last rune (Fe, Feoh or Fehu depending on which system and naming convention you follow) became the first one. FE refers to mobile measured wealth in the form of cattle, meaning “tamed “ and domesticated cows. By extension this refers to material wealth as in money. UR (or Uruz) is said to be the rune of Audhumbla (the primordial cow mother who was there at the same time as giant Ymir) and it refers to a great reservoir of untamed energies (or potential) that have not yet divided, polarised or taken a final definite form. We can engage and "dance" with this energy - but we cannot control or direct it. It is also said that the wheel of the runes (as do all alphabets!) tells the story of creation. It seems unlikely to me (and the Eddas tell a different story!) that there was domesticated cattle and “money” at the beginning of the cosmic cycle we find ourselves in. Creation (the world as we know it) did not start with tamed cattle, money and mobile wealth. (The beginnings of that are found in the Neolithic period in Europe). Many authors have discussed the existence of the Uthark: some accept it and others reject it. Those who work with the Uthark find profound correspondences and wisdom teachings with the “dial” set in this position. We do not know exactly who put the runes in a certain order and when this occurred. We do not know either why it does not follow the “phonetic letter order” of nearly all European alphabets. The order of the runes in the Elder Futhark is based on ancient rune stones. It still poses a number of mysteries: it is not completely clear that the first rune is Fe, the final rune is an odd “tree-like” rune with six twigs on the left and eight on the right of a single stave. This could be a bind-rune – but we do not know for sure. We find variations in rune order even today: some rune magicians reverse (as perceived from my own point of view!) Eoh and Perthra, also Dagaz and Odal. Meaning that if we put FE in the first position there is uncertainty whether the final rune is Odal or Dagaz. The field of numerology (and the study of ancients scripts and alphabets) tells us that every position has a unique meaning/frequency related to cosmology – so what position we allocate to the runes does matter! 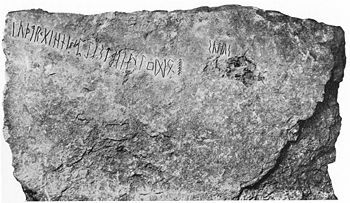 It is a vast subject and much has been written about the runes. My personal viewpoint is that there is no “right or wrong” but instead we find an immense richness when open ourselves to different possibilities and become willing to receive the ancient wisdom teachings inherent in that. I have worked with the runes for many years and they are like portals or great gates: they continue to "open up" and reveal new dimensions of meaning all the time and I do not believe one can every know the runes 100%. They tend to reveal as much as the student or apprentice rune magician is ready to absorb at a given time. Evolving Gods: The Sacred Marriage of Tradition and Innovation. For occasional updates on courses, events and new material, consider subscribing to my newsletter (drop me an email and I will take care of that). I also invite you to check out The Rune Drum videos from Scandinavia on my YouTube channel! 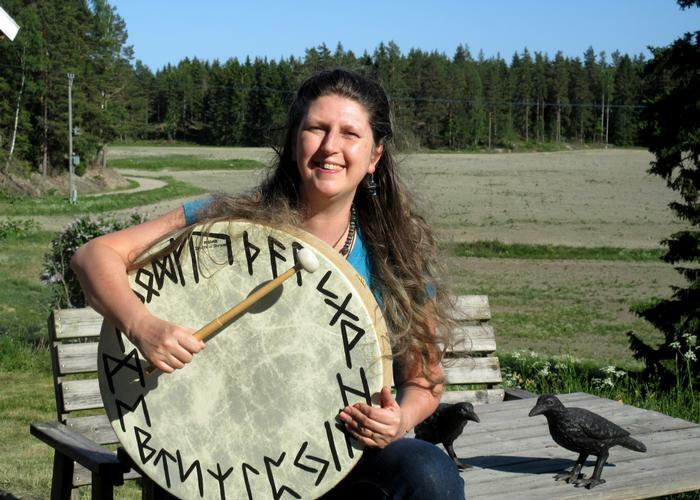 Imelda Almqvist is an international teacher of shamanism and sacred art. Her first book Natural Born Shamans: A Spiritual Toolkit For Life (Using shamanism creatively with young people of all ages) was published by Moon Books in 2016 and her second book Sacred Art: A Hollow Bone for Spirit (Where Art Meets Shamanism) will be published in March 2019. She was a presenter on the Shamanism Global Summit in both 2016 and 2017 and is a presenter on Year of Ceremony with Sounds True. She divides her time between the UK, Sweden and the US. She is currently in the editing stages of her third book “Medicine of the Imagination: Dwelling in Possibility” and has started her fourth book "Evolving Gods: The Sacred Marriage of Tradition and Innovation". She has been filmed for an episode of Britain Mystic, on the Smithsonian Channel, talking about Mesolithic site Star Carr and arctic deer shamanism, wearing a stone age antlered headdress!